Living to experience and enjoyable ! Diamond Bay Condotel - Resort was built on an area of 10.78 hectares right at the heart of the Diamond Bay city ‘s tourism, recreation and the resort complex up to 300 hectares . With the beautiful location of “leaning back to the mountains facing the sea “ Diamond Bay Condotel - Resort is surrounded by the green mountains all year around is very majestic and spacious , The Lo river is very gentle and winding together with the vast ocean carrying the source of the fresh airs by the sea .A stunning private beach is the best choice for your vacation with the beautiful tropical trees ,the white sand , the wonderful climate and the spacious mountains . 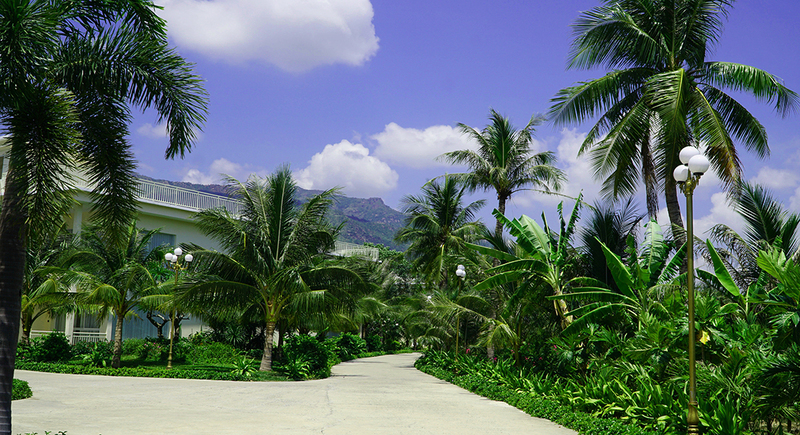 Staying at The Diamond Bay Condotel - Resort , you will experience the fresh airs and the most natural landscape . Diamond Bay Codotel - Resort was designed with the modern facilities and premium standards , including 1,034 apartments and 376 luxury bungalows with the atmosphere is sunshine and air space, in harmony with the nature through the wide windows , luxury , spacious , cozy beds and European- style architecture with the neutral colors such as the white color of the stones , the deep brown of the woods , the transparency of the glass …the excellent combinations for the guests to feel homely and very warmly staying . Diamond Bay Condotel - Resort promises to bring to you the best memorable for your holiday.